This next round of signs for the Granville Dance and Music Building proved a challenge to stay within Granville's changing signage codes and variance process. A well-designed, functional and affordable solution was created for these clients. 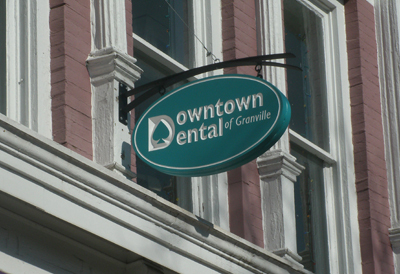 Julie Judge came to me with the request to design signage for the historical Granville Depot that would be both within Granville sign codes, and refect the building's architecture. All while conveying the Keller Williams brand and promoting this local realtor's business. Granville Fitness has new signage at their studio on Westgate Drive on the east edge of the village. The new building sign is a three dimensional translation of their logo. Design drawings, fabrication specifications, site plans and photographic mock-ups were part of the Permit Application that was easily approved by the Village Planning Commission. Readers' Garden in Granville on the corner of Prospect and Broadway upgraded their window signage with graphics that entice pedestrians to cross the street and a design that is visually cohesive with their existing signage. Shop owner JoAnne Geiger comments, "Jodi can take a concept and run with it, jumping through the necessary hoops to bring the idea to fruition...Jodi did a quality job on my new window signage, going as far as working with the Planning Commission. I didn't have to do a thing except tell her what I wanted." Still in use, withstanding the test of time for over 13 years, this exterior and interior graphics and signage standards package was developed for Mitchell's Fish Market's, the Cameron Mitchell restaurant. Starting with the original restaurant on Olentangy River Road in Columbus as the concept project, the Fish Market restaurants now have twenty locations in nine states. Aultman Hospital extensive signage project for the hospital's outpatient campuses in the Canton, Ohio area are still in use after over 13 years. Working with designers and landscape architects, the exterior signage package was created for several outpatient clinic complexes. Existing corporate graphic standards were melded with exterior design elements to develop a wayfinding system and a complete signage standards documentation manual.